…live in concert. That’s right, people! 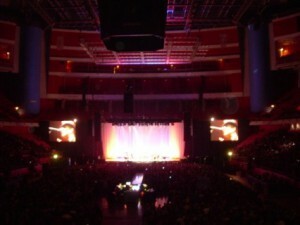 Last night, for three glorious hours starting at around 7:30 PM, I saw and heard God sing from a stage in Globen here in Stockholm. God is a 74 year old Canadian gentleman in a rather nice hat, with lyrics which make the earth sigh with pleasure and a voice that can make a nun quiver. God’s name, is Leonard Cohen. I hadn’t heard. But once I did, I knew this was my chance. Maybe my only chance. So I took it. And with said friend, my mother and my grandmother, I went to the concert I thought I’d been born too late to see. And boy was it worth the wait! It was an incredible show. Cohen’s voice, which to my untrained ears was once a smooth barytone and is now a somewhat rough trembling bass, was wonderful to hear and so powerful even after such a long career. To make things better, he played all his most classic songs and a few more, and in pauses between the songs he proved to have a sort of dark, twisted humour that I adore. 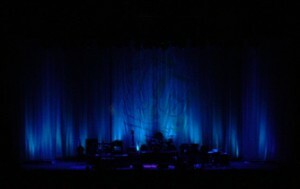 “I had a rigorous spiritual experience..” Cohen says after the first few songs. “..as I was walking through the streets of Stockholm yesterday and today. I realized that everyone here is taller and better looking than I am.” He goes on to apologise for singing his little songs of sadness and distress when we have such a civilized country, and adds that if it wasn’t for our artists he would think all was well here. “But..” Cohen continues. “When the world is plunged in chaos and suffering…Ring the bells…” And so starts Anthem, one of my long-time Cohen favourites. Half the songs brought tears to my eyes, and during the twenty minute pause in the middle of the show my friend and I agreed that each song so far had made us shiver. “He’s quite a handsome man.” My grandma said during the break. “Those women who are doing the backup singing, is one of them his wife?” I tell her no, not as far as I’m aware. “Why?” My mom asks. “Planing to make a move?” My grandma laughs, we all do. I tell them I wouldn’t mind. Cohen as my step-grandad would be a-okay by me. So long as it’s okay to consider your step-grandad’s singing voice a turn-on. After the break the show, and the awesomeness, continues. What strikes me again and again during the course of it is how Cohen seems to enjoy it almost as much as I am. As the ending tones of Tower of Song rings through the room Cohen watches his three backup singers repeat the soft “du dam dam dam de du dam dam” with a little smile on his lips, urging them to “don’t stop, friends”. Still watching them he says how he often thinks about the great mysteries of life, the riddles of suffering. But in that moment, he says, he has found enlightenment. He knows the answer. Then, with an almost mischevious glimmer in his eyes, he turns to his audience. “Would you like to know it?” The audience answer in a sort of inarticulate mix of voices and hands clapping. “I’m not sure if you’re hungry enough for it.” The audience roars, claps, hoots, calls, whistles and stomps its feet. “I’m reassured.” He tells us. He will tell us the answer to the riddle. “Du dam dam dam de du dam dam.” The audience laughs, I laugh, Cohen grins a little. Roscoe Beck, musical director, looking and sounding ever so cool on the standup bass and the electric base. Bob Metzger, on the guittar (both electric and acoustic, I think), playing wonderfully. Javier Mas, who may possible have the fastest fingers I’ve ever heard in person, working wonders on all manner of string instruments some of which I don’t know the names of. One of them was called a Bandurria. Rafael Bernardo Gayol, on drums. The group’s timekeeper, and very charming. He blew the camera a big kiss towards the end. Dino Soldo, a magician on the saxophone and a bunch of other wind instruments that I don’t know the names of. Sharon Robinson, as lead back-up singer. She has worked with Cohen on and off since the late 70s and has collaborated with him both as a writer, singer and producer on several cds. Truely amazing voice. And lastly the, as Cohen called them, sublime Webb sisters who I believed weren’t meant to be in the band originally. Both with voices like angels. Hattie Webb played some sort of harp for a song or two. Charley Webb, when Cohen replaced the word man in a verse of The Future and sang “The white girls dancing”, handed her hat to her sister and did a cartwheel on stage. The reason why I wanted to take the time to mention each musician in person was, apart from the respect and admiration I have for them, the fact that Cohen himself took care to mention it so many times. Each member of the band was introduced to the audience at least three times. Some of them even appeared to blush, seemingly almost embarrassed by the attention, compliment and applause they recieved. It struck me many times that Cohen was as honoured about playing with them as I am sure they were about playing with him. Cohen was clapped back onto the stage three times after the “last” song. He did 7 encore numbers, including Closing Time and a song whose title slips my mind that begins with the line “I tried to leave you” (another bout of laughter from the audience followed, the timing was excellent). I didn’t want it to end. But eventually, after three glorious hours, it did end. And so I leave. On the way to the subway I buy a t-shirt with his face on it and the tour details on the back. On the train home I write most of this peice in my head. On my way to bed I realize something. I had hoped, or rather not dared hope, I’d get to see Cohen live just once in life. Now I have, and it has brought me a tiny step closer to dying happy (in some distant future). But, which I didn’t expect, it has also woken a hunger for more. Should I ever happen to be in the same city as Cohen show again, I think I shall have no choice but to go. After all, who wouldn’t want to see one of their very own gods perform live…twice. This entry was posted in Spotlight and tagged inspiration, leonard cohen, music, spotlight by Emma Lindhagen. Bookmark the permalink. Next → Next post: Twice Fortnightly – Short and Sweet!